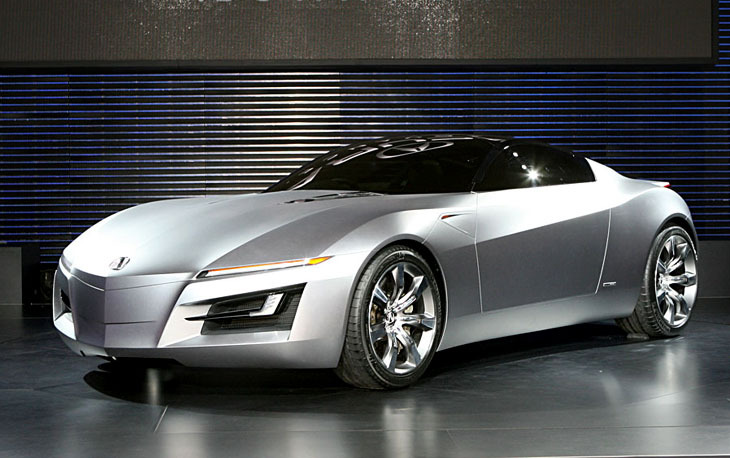 The Acura Advanced Sports Car concept, which went on display at the 2007 North American International Auto Show was designed to provide a preview of the next generation Acura exotic sports car. Or NSX for short (see also the Honda HSC concept). The Acura Advanced Sports Car Concept is designed to incorporate a front-mounted, V10 engine and a new high-performance, version of Acura's exclusive Super Handling All-Wheel Drive (SH-AWD) with bias given to the rear wheels. The Advanced Sports Car Concept's exterior features a long, pronounced hood with sculpted lines and embossed air vents, and exterior styling lines which run the entire length of the body, creating a ribbon-like effect from the front headlights to the rear wheel arches. Although modern in its appearance, the Acura Advanced Sports Car Concept retains the subtle cues associated with its predecessor, the Honda/Acura NSX. The concept's slim, LED headlights are pushed wide and designed to mimic the pop-up headlights found on the first generation NSX. Other styling cues include a modern take on wraparound rear taillights and the all black cockpit made from tinted glass. Under the pronounced arches of the Acura Advanced Sports Car Concept are custom made 19 inch front and 20 inch rear wheels made from billet aluminium. Behind these are carbon ceramic brake disks gripped by eight piston calipers. "Our intention was to design an exotic sports car that gracefully combines advanced technology and strong emotion," said Jon Ikeda, principal designer, Acura Design Center. "The technical, machined surfaces and keen-edge design are balanced with sweeping curves and dramatic lines, all of which results in the ultimate exotic sports car."